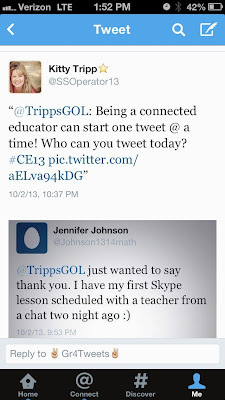 The world of education has dedicated October as "Connected Educators" month, and the Twingdom and blogposts are alive with how and what a connected educator should look like. 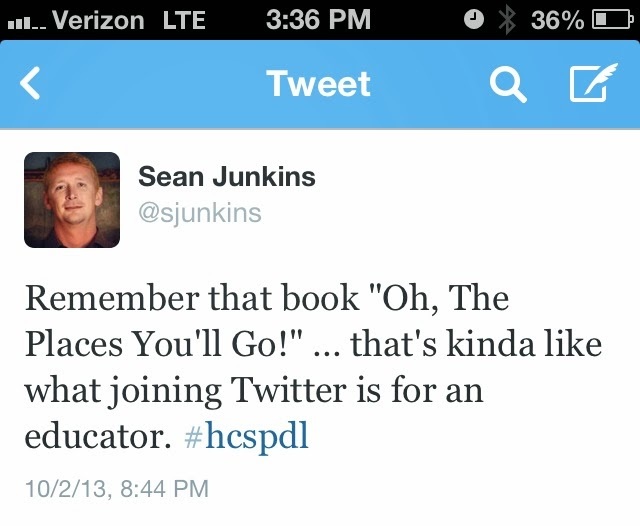 As I look back to my beginning days of connectivity, I want to dedicate this post to those educators just beginning the process of becoming a "connected educator." My journey began about four years ago when I was introduced to Skype and quickly developed a desire to move beyond the walls of my classroom. So began a journey of learning about a world I had never known. There were no school mentors or advisors on where and how to get started. I took the plunge into the unknown and started exploring! People like Silvia Tolisano of Langwitches, Steve Hargadon of Classroom 2.0 and NZChrissy of Teaching Sagittarian were my initial teachers. My first collaborative project was Around the World With 80 Schools where Skype allowed my class to explore the United States and then hop the ocean to discover classes in Hungary, Argentina and Thailand. I didn't know much about what I was doing, but I was armed with a desire to learn about and experience global collaboration. The next big step that catapulted me into the ocean of collaboration was Twitter. My initial assessments of this tool were not favorable, as the instructor introducing it to me had the class join and follow her, but gave no instructions on how Twitter could be used as an educator and in my classroom. So, I placed the Twingdom on the shelf as useless, and continued my quest into other collaboration tools. Thankfully, over the next 6 months, every part of my research took me back to Twitter. I tried it again. It wasn't easy to figure out, but I was so grateful for people like Linda Yollis, Kim Powell, Theresa Allen, Nancy Carroll and Paula Naugle who patiently tweeted me, skyped, and sent resources. I started observing and learning from the best, constantly looking for ways other educators on Twitter were learning, exploring, and finding success for their classrooms. I grew bolder and started tweeting questions and joining chats. I started tweeting my blog posts and other activities my class was involved in. The world of Twitter had come alive to me! I was hooked, and I couldn't ever imagine going back! Life without Twitter would be as if Y2K had really happened! After two years of tweeting, lurking and learning and encouraging others to join the Twitterverse, I decided this summer to become intentional in my collaboration with other 4th grade classes on Twitter. I wanted to specifically collaborate in math and science since these were the subjects I taught. Throughout out the summer, I searched for classes and started a Google Doc for those who wanted to collaborate. As the first weeks of school rolled by, I continued reaching out to those on my list. I started two projects that have helped reinforce these new connections. Pumpkin Power just ended, but there is an amazing line-up of teachers ready to explore the world of Mystery Number Skype. Please join us if you are interested! Amazing connections are beginning to form and so many possibilities lie ahead, possibilities that only happened from some determination and intentionality. My future steps as a connected educator are to continue developing daily/weekly curriculum interactions using Twitter and Skype with my new amazing group of educators. I'm convinced exciting opportunities can only come out of us charting the waters of collaboration together! 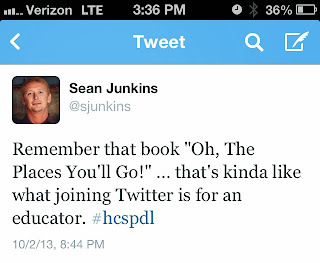 If you haven't read Oh, the Places You'll Go lately, dust it off, give it a read and may it inspire you on your journey to becoming a connected educator! I'd love to hear about your adventures of becoming a "connected educator." Reading is one of my hobbies. I like to blogs to get such interesting posts. Every blogs has their own writing fashion and I got to learn many things from this blog. Thank yo so much for the writing.